Iiiiii am so happy that this unique place exists! I have some of my classes as well as my stage (=internship) at Porte de Clignancourt, a mention of which usually doesn’t elicit sighs of jealousy from my friends. Ok, so it’s not Saint Germain. However, real people live and work in this area, and there are some hidden treasures next to the Macdo, KFC and un-classy stores selling imitation shoes and suitcases – beautiful music performed by conservatory/Sorbonne students for affordable prices at one of the campuses of Paris-Sorbonne University (this is where I study and work, shameless marketing plug alert), an antique market every weekend, stores like this with cheap vintage clothes just waiting to be dug up, and now, La REcyclerie! Where to begin? There are so many great things happening in this place. 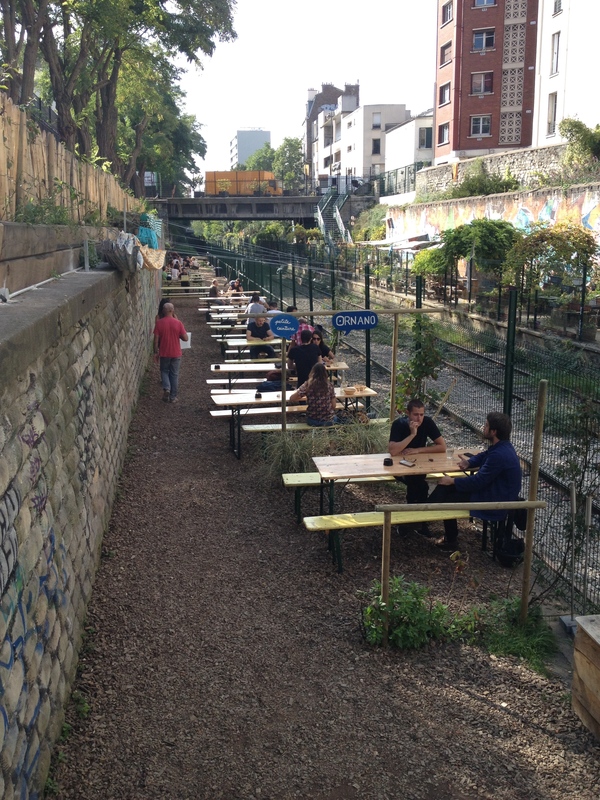 It is located right inside the old, abandoned train station that was part of la petite ceinture (basically the pre-Métro – great photos here). 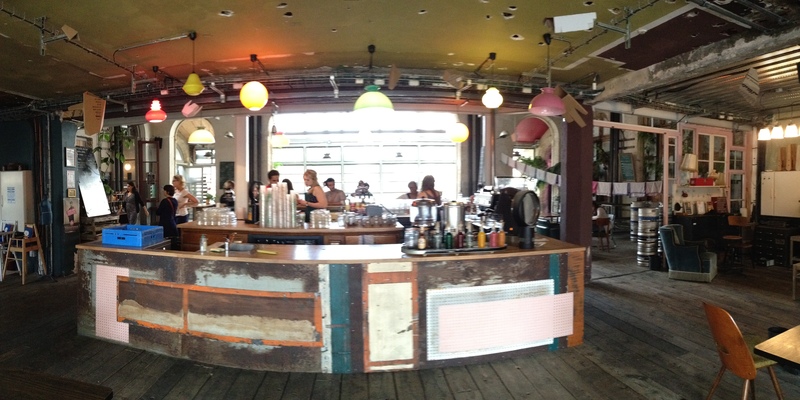 It is a restaurant, bar, cafe, event space, all with a no-waste, green ethos. And yes, I see the irony in my writing a blog post on my Macbook Air about an association whose philosophy is centered around low-tech things, but hey…the new generation gets their information online, so I’m providing it. They have frequent workshops – DIY eco-beauty products, and events where you can use their tools for free to give new life to broken furniture and things. I love the spirit behind that. The inside is spacious and light-filled with plenty of seating options. The canteen-style food is based on regional themes that change weekly. The week I ate there was Moroccan week, and it was good! 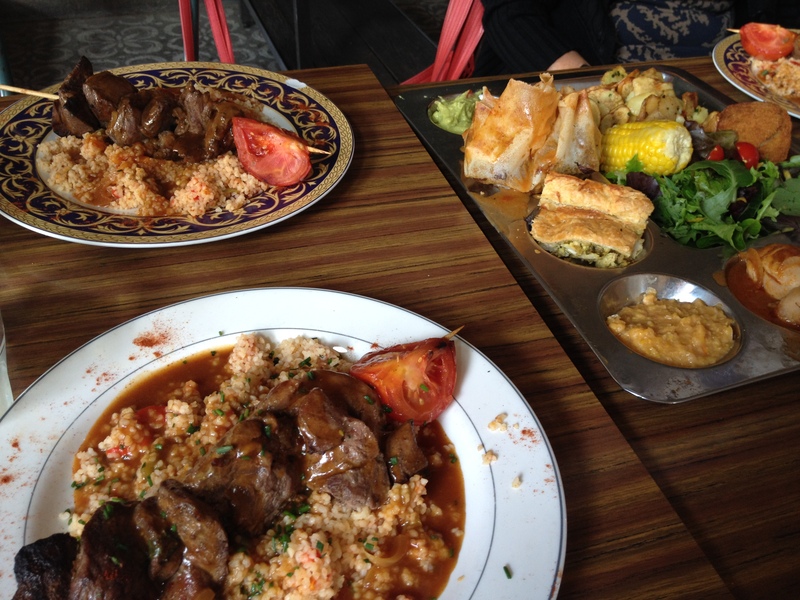 It’s definitely the best option for lunch in the quartier – I must say that I’ve had my fill of CROUS food. I’ve also popped in just to study and write – the espresso is good and I love that they have sirop à l’eau for just 1€. And because the space is so big, there are no glares from the servers, and did I mention there is free wifi? 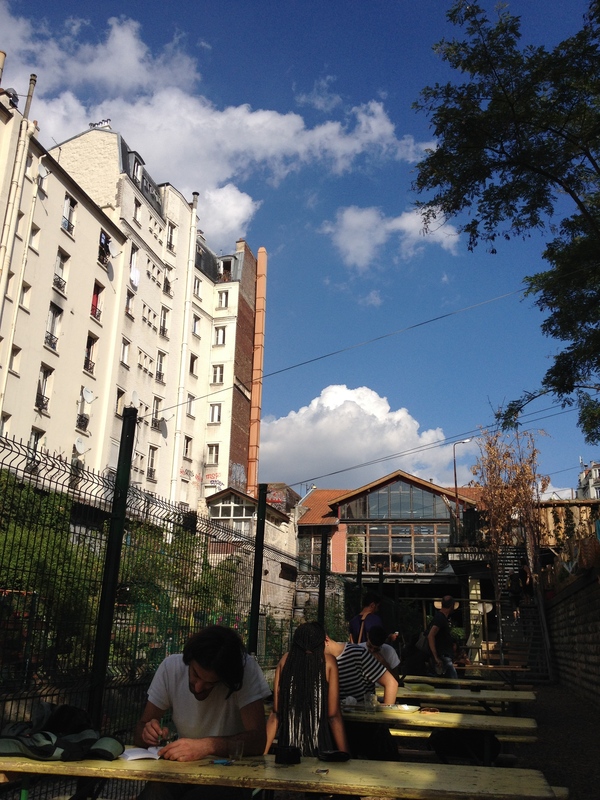 Ok so I saved the best for last: you can also go outside to a long, narrow terrasse right next to the old tracks, which faces a community garden and is right under the chicken coop! It’s so nice to be in a space like this instead of directly on the street like most cafes. A friend had her birthday here a few weeks ago. Though there were many people there that night, it didn’t feel packed like every other bar here. There is so much space for everyone to spread out! No sweating and shouting to be heard on a Friday night?! sounds extremely cool! hope you don’t get pecked by the chickens on the terrasse however.